Lunes a Domingo de 17:00 hrs a 23:00 hrs. A new gem of a restaurant in Old Town. Food, ambience, and service are top notch. Greek dishes plus other choices. Great selection of wine. You will not be disappointed! Eclecticos is next door to one of our old favorites, Coco's Kitchen, and is relatively new in that area of PV. We like that Chef Ruben chose to highlight Greek cuisine because that is not common here. My wife won't eat meat, so we concentrated on seafood. Everything we ordered was very good. The shrimp and artichoke appetizer in lemon sauce and the pistachio encrusted sea bass were outstanding. The wine list is more than sufficient and the prices quite reasonable (high wine prices are one of my pet peeves). There is also a list of special cocktails that we enjoyed before dinner. We plan to return soon and I'll start exploring the meat dishes. We were two couples who went for the first time to dine at Eclécticos a few nights ago and we loved the experience! We all live in Puerto Vallarta a great part of the year and we are used to the many wonderful restaurants we have to choose from here. Even so, we found Eclécticos to be a delightful new restaurant with really delicious food. The decor is lovely, the Greek music was pretty and put us into the mood for the Greek-style plates that we shared. Eclécticos was referred to us by several friends and we will in turn be suggesting it to many more of our friends. The octopus appetizer was very tasty, as was the duck main dish, likewise we enjoyed the lava cake for dessert very much! The service was quite good. Our waiter was friendly and knowledgeable. The problem was our entrees took a very long time to arrive, while we watched two other parties who didn’t order a first course receive their entrees long before ours. The food was spotty. On one dish the rice was undercooked or pre-cooked and dried out...too chewy. On another the polenta was unseasoned and dry and over cooked. The cucumber soup was under seasoned and basically mushy cucumber juice. The encrusted sea bass was ok, but again under seasoned. For the quality of food you can get in PV this place seems to our party to be overpriced for the quality. Maybe they were just too busy to take the care needed that evening, in which case they need to tighten their ship. Really enjoyed our meal. First time going but will definitely return. So happy you enjoyed your meal and want to return. Thank you for the nice comments. Please let me know what we can do to earn 5 stars from you! We love making your experience relaxed and lovely. Nice dinner before a show at the Palms. Greek food was a nice treat. Our server recommended a lovely Mexican wine and we were pleased with wine and the evening in general. Very enjoyable experience. Our table was by the pool, very charming. We love when we get diners who go to a show at the Palms! So close and performing arts with good food is such an amazing part of the Puerto Vallarta experience! We love all the arts! Thank you for trying the Mexican wines, we are very proud and personally, enjoy the lovely wines Mexico produces. Hard to find these Mexican wines in other parts of the world and we are anxious to share. We look forward to you returning to PV. Select the Garden Area near the pool for your dining experience. Truly amazing! Thank you John. We are so lucky the beautiful Hotel Mercedes let's us share their serene courtyard. A quiet refuge in a popular area. Cool you mentioned the beer. We like sharing Mexican artisan beers and wine. The service was five star and the food was outstanding. Thank you Linda! Hope to see you again soon! We really appreciate your support and lovely 5 star review! Eclecticos is a great place for delicious Greek dinners. Service is supurb, something that may not be too plentiful in most PV restaurants. Chef/owner made the rounds. Waiters regularly stopped by to see if all was OK. Thought I was in Greece. Great service and wonderful food. The mousaka is a must and the tapenade one of the best we have ever enjoyed. The best service we’ve had yet. Jorge was great. The special shrimp appetizer was outstanding. We had the duck, rack of lamb, and pork shank. We were there twice on this trip and we will be back when we come back next year. Wonderful food, pork shank fall off the bone delicious! Sat outside and was able to watch sun set. Quiet comfortable and relaxing! I’ll be back. Great relatively new restaurant in PV! Excellent food for most everyone but falls short of "fit for foodies". The food is overall very good but not yet consistent for all menu items. The rack of lamb and leg of lamb were excellent as were many of the appetizers. The Greek salad lacked seasoning - mostly a big bowl of vegetables without the traditional Greek flavoring. Sea bass in not yet good and too bad because many at our table wanted to order it but had read online reviews and the waiter confirmed them. The Moussaka was average. It was not layered like a traditional one and was more of a lamb casserole. I wouldn't discourage people from ordering it but aware if you are a Moussaka fanatic. We had an excellent red wine. The white wine was served cool and not cold. It also was not in container to keep it cool. In fairness we did not ask and should have. We had a 6:15 reservation so the restaurant was not full, no music yet so it was nice and quite. The ambience and décor is excellent. It is very open to the outside which we loved. The service was outstanding. The waiters were very friendly, attentive and checked on us several times. We would recommend and return. I brought in guests and they lived the food,atmosphere, and service. They have been on PV many times and felt that the meal was one of the best. I was really pleased that I had selected Eclectiod for my well- traveled friends. The food at Eclecticos was excellent. The service was terrible! And the band playing just outside made it difficult to hear. We were disappointed. I'm not sure we'll give it another try. Thank you for visiting Eclecticos. We love that we have so many diners having a good time and with the low ceilings in that area it can get loud but we are working sound absorbers to make it really comfortable. We were surprised by your rare comment that the prices were similar to the US and Canada for a quality rack of lamb at 16.65 USD and that includes the government 16% sales tax in the price. Please come back and I will be happy to get you a table on the terrace. This was our third visit since it opened this past December 2018. As usual the food and service were exceptionally good. A real treat in Puerto Vallarta. I am finding it difficult to write this review because there was some good and bad at Eclecticos. In the beginning the service was friendly and prompt and near the end of our dinner when we wanted our bill, we waited for quite a while. The food, I found it expensive for what you got. Our appies consisted of shrimp in a lemon sauce (not great but OK). The Spanakopita was good but on the cold side. My wife ordered the sea bass which was definitely not sea bass. It was a overcooked fillet coated in panko and very tough. Certainly not coated in pistachios. When my wife went to the restroom she noticed another table was in the process of sending their sea bass back to the kitchen. One of our guests ordered of Moussaka which was pretty good and the other two mains were the rosemary rack of lamb. This dish was a big hit very nicely prepared and very flavourful. The we thought the drinks were a little pricy at 140 pesos with little alcohol. This was our first but certainly not our last visit. Dinner was outstanding. I can not wait to try more things on the menu! Muchas Gracias! Job well done! It always exciting to have a new restaurant t in Vallarta, especially when you spend 4 months there. This restaurant didn’t disappoint. Service was excellent, the food tastes delicious, the portions more than adequate. It not over the top. The pricing is right in line for what you are getting. I would recommend sitting inside as the patio overlooks a busy street that is quite noisy. La comida es muy sabrosa, y los meseros son muy agradables y eficaces. Wish I could have said “I don’t know” to question about whether or not I’d refer it to a friend. Great setting. Waiter told us about their special “only one bottle left” Malbec. I chose a cheaper bottle and was told they didn’t have it. Ordered the more expensive special one. I’ll never know if they had the lower priced menu Malbec or not. Special one was great—absolutely—but it felt like an upsell. Ordered moussaka and sent it back. Unbelievably burned. Had to press hard to cut it with a knife and that made me turn it over to check—black and hard on the bottom. They replaced and it was delicious. My second visit here and I’m neutral. Not sure they’ll be a third try at it. Very glad you came to the restaurant. Sorry you felt it was an up sell. I know the wine this waiter was offering you, we love it & consider it a real find! Laberinto, Malbec from San Luis Potosi, Mexico, everyone's favorite, especially for the price. Glad you enjoyed it! I apologize we didn't have the 400 peso Chilean bottle that night. Unfortunate about the first Mousaka. No excuse for that being served. Glad the kitchen responded quickly. Hope we see you a 3rd time. Your patronage is valued. Really didn’t like the table we were given as two people were on a low backless sofa and the waiter goofed up three out of four drink orders. BUT I thought the food was very very good and all 6 of us agreed we would go back and recommend it to others. finding it. Our GPS directions were incorrect and we had yeo different addresses. Eclecticos is a hybrid restaurant that combines some Mediterranian/ Greek dishes with the local ingredients. The concept is great but the actual dishes were of somewhat disappointing. For the prices this restaurant charge we expected to have higher quality dishes. I had a sea-bass fish, the flavor was good and special (they're using funnel spice for seasoning), but the fish was kind of dry and the portion of the plate was small. In general, the portions of the dishes are small and similar to a 'gourmet' type of restaurant where you need to order multiple dishes in order to be satisfied. On the other hand, the ambiance was very good, the waiters and the bartender were very nice and kind. The two musicians who played live greek and Arab-inspired music were phenomenal, they played with authentic Buzuki, Oud and Spanish guitars. An excellent place for a meal if you are partial to Greek food with a touch of Mexican thrown in...…………. The service was prompt - neither rushed nor too slow - and very efficient. Periodic visits and chats from the Owner to make sure that everything was to our satisfaction - and it was...…………. The wine selection was good and moderately priced. The "salsa picante" was interesting, and as far as I could make out, was a "grandmother's special". Love this restaurant! We have been several times and have enjoyed everything we have tried. Every appetizer is fabulous, the moussaka is perfect, as is the lamb! Jorge gave great advice on the wine pairing. Happy to have a mediterranean/Greek restaurant in the PV area that serves really good food & has a varied menu. The owner, Natalie, is a great gal who wants to please her customers. She's been in PV for a number of years in other capacities. We have eaten at many great restaurants in Puerto Vallarta and Eclecticos was the best meal we had, really outstanding. Wonderful dinner with a lot of variety on the menu. Tapenade, Stuffed grape leaves and octopus appetizers were great. 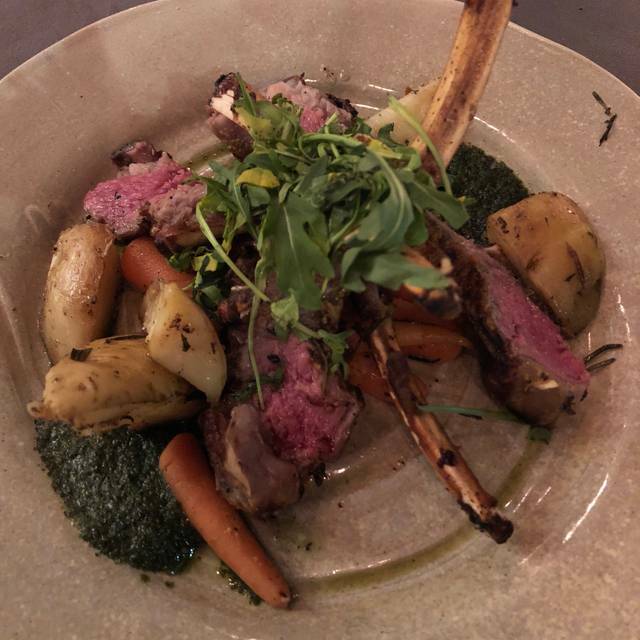 The lamp chops with mint pesto are fantastic! We are happy to have a good Greek restaurant back in town! My mom and I dined here this evening. We agreed it was a one and done. While the service is pleasant it is not very attentive. I started with the cold cucumber soup. It was flavorful but I soon grew tired of eating it as it had a strong raw garlic taste. I had lamb chops for my main. They were good. My mom had the pistachio encrusted fish. The piece of fish was so thin and she said she tasted no pistachios. Both dishes were served with lukewarm potato wedges that felt like they had been sitting for awhile, though we were the second table of the night, and carrots and string beans. This is a great new addition to the PV food scene. The food was great, owner came out and chatted along with the chef. I will make it one of my go to spots from now on! The restaurant is fairly new and is a bit of a mix of Mediterranean (mostly Greek) and Mexican. They have a few tables on the sidewalk and ample room inside with wide open doors as well as a courtyard which I believe belongs to the hotel and may only be used in the evenings. We chose to sit in the courtyard and it was extremely pleasant and comfortable. Noise level was low compared to the front of the restaurant. Service was very good and knowledgeable on the dishes. For cocktails we had a Butterfly and Frida's special and thoroughly enjoyed them. The wine list is not extensive and ranges from 400 to 600 Mxn and mostly South American. We started off sharing the dolmades (Dolmas on the menu) and we weren't disappointed. I chose the Moussaka as it was recommended by the waiter and my partner had the pistachio crusted sea bass. Both were very good, but I would go back specifically for the Moussaka. Off to a good start and I hope this continues. The food was good, a little slow, but that is expected in a new restaurant. Our main courses were great. Appetizers were very good and drinks and service was good. Great location and great personality. Loud. Very loud. So loud we (8 of us) all had headaches and earaches before the dessert arrived. We had the set menu for New Year's Eve, which was very good. We'll return for their regular menu and hopefully it'll be quieter. Service was attentive even though the place was full . First time trying out this new addition to Puerto Vallarta. Amazing food, great cocktails (loved the Greek lemonade) and wine list, wonderful ambiance and very attentive service. The back garden/pool area is beautiful and quiet. Highly recommend! !